Weather Underground was predicting 10 km/h winds from the NW, so I drove to Ventanas in the hope of getting one of the few flat-water days of the area. I don’t particularly like Ventanas or Sargento, it’s too shallow and the spots are way sandy, but I do visit once in a while, just because. As I reached the desert crossroad, I saw the large Mexican flag waving in the wind… Indicating wind much stronger than 10 km/h coming from the South East, the very worst scenario. I drove to Ventana anyway. Sure enough, the baby boomers we out with their kites, doing their jumpy thingies, their left and right stuff, and generally going nowhere with prohibitively expensive wings. No sandstorm peeling my car’s paintjob, yet looking at the white caps, I turned towards the shelter of mountains further south. One reason I did not mind going to Ventana was that I would not have to face the Saturday fishing mayhem of other spots… Arriving at the parking lot, I drove past twenty trailers. Fortunately, many of them already had their boat loaded. There were still about ten of them out there, each one sure to buzz by my kayak and my dive flag. The sea was flat, but I felt the incoming tide. On the water, I was by myself. I guessed all the other fishermen were out South… because you wouldn’t want to be at the island with the wind, unannounced or not. Looking far to the horizon, I could see some of them, maybe five miles out. I started by taking a target out to test my 150 cm speargun. Last year I did not have much success with it and thought perhaps the aim was off… Confounding me, it turned out to be super precise with one or two bands, one or two hands, in any configuration… So out I went to the deeper spots I had identified. I did something I rarely do. I got my float out. I dove the same area without a float a few days before and I was not always comfortable trusting my reel at 26 meters of depth (almost 90 feet), and now I held a 150 cm behemoth of a speargun. The visibility was around 20 feet. Which is good for this area. My anchor indicated a dept of 18 meters, but that could mean it was on top of a boulder… I went down and sure enough I leveled out at 22 meters. First dive, snappers come to me. Small cuberas, but I take a shot since I want to test that gun. –	Foompt! makes the gun. Right in the head, the fish does not struggle one bit. I shot four fish like this. Each in the head. The only one that struggled even a little was the yellow snapper (9 pounds, quite a large specimen since the record is 13 pounds). Now I’m all confused. 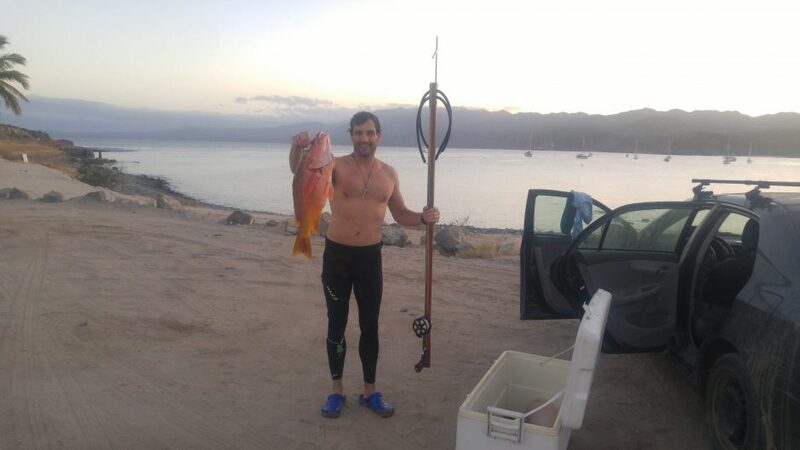 Can a 150 cm speargun be the right choice for Baja, even for shore diving?